(Boat Location: Panama City, FL) Be a Pirate . . . Live the Dream! This yacht is for those of you who may still have a drop of Pirate blood running through your veins, and especially for those of you who harbor the remote urge to one day act upon it. Whether you’ve always wanted a pirate ship, hope to be known as the best dad ever, are looking to run a fantasy charter, or are just want for a unique vacation getaway, she’s out there and she’s called Midnight Princess. Built and patterned after the infamous Privateer sailing vessels of the 1800’s. Assembled in 1972 primarily of mahogany and teak she is an original that would cost a pirate’s treasure to duplicate today. Okay, here’s something you didn’t know. Pirates are progressive. This Privateer does have a full complement of electronics: Raytheon radar, GPS, chart plotter, Standard digital depth finder, and two VHF marine radios. Pirate cooks also used 4 burner stoves with oven and microwave. When the winds die, the Ford Lehman 120hp diesel is employed. That Midnight Princess went through a major seven year rebuild in the 90’s and additional upgrades in the last three years, including woodwork and virtually all systems, insures she is ready to sail. 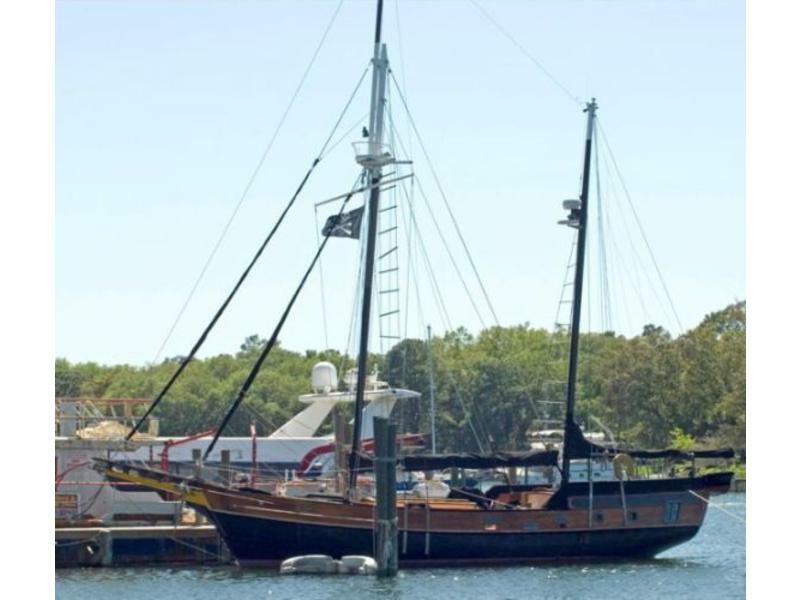 I know this pirate ship, she is berthed in Panama City, she’s 58′ LOA, 44′ LWL of history, manageable by a couple, and in excellent condition. Her asking price of $229,000 is so far below replacement cost it’s embarrassing. She is the perfect vessel for either commercial or private use.